30 Years Later the Magic is Still Happening – Even the most skeptical have to acknowledge this extraordinary chain of events that brings more media attention to this new book. Here’s the link to the press release. It seems the tide is turning for the mainstream’s acceptance of life after death. “Heaven is Real” – “Proof of Heaven” and now “An Upraised Chalice” in the News” -Todd Burpo and Lynn Vincent’s “Heaven is Real” and Eben Alexander’s accounting of his near death experience has been at the top of the best seller list for many months and received cover story status in Newsweek. “Heaven is Real” is a major movie drawing large crowds. Now a new autobiography that is a spiritual adventure story “An Upraised Chalice” details multiple near death experiences and explores the karmic circumstances by which they happened. This in addition to describing a lifestyle that is “spiritual but not religious” that “affords great benefits including protection of oneself and ones family.” The implications of this controversial story are good food for thought. Do you consider yourself more spiritual than religious? 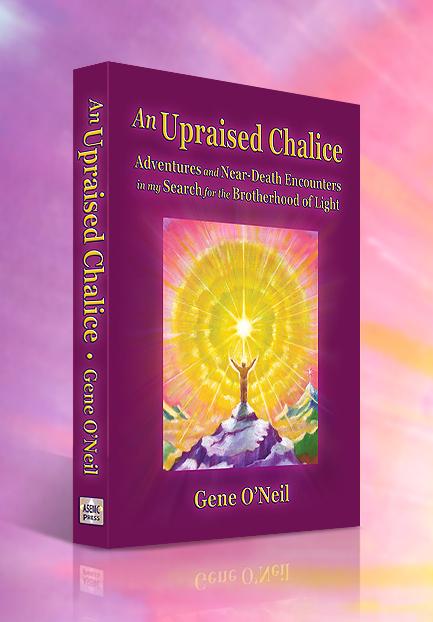 One persons compelling response to this question is the subject of a new book – “An Upraised Chalice” is a spiritual adventure story in which the author takes the reader on a life time quest in search of, and integration with a spirituality that he felt within but that was outside the walls of organized religious dogma. Now many consider themselves “spiritual but not religious. This phenomena has been the subject of several stories in mainstream media exploring “the new spirituality” across America. Recently CNN published two stories on this subject. The first Good news about the ‘spiritual but not religious’ appeared on Feb 22, the second Why Vermont is not Godless appeared on Mar 18. Science and Spirituality a new twist – A controversial true story -The scientifically orientated community will have to sit up and take notice of “An Upraised Chalice.” This story written by an apparenlty very well grounded and practical man, who is among other things a FAA certified flight instructor, details a life long quest in search of the ancient wisdom. Teachings long guarded and taught by great masters of wisdom who compose a Brotherhood of Light. Multiple near death encounters, archangels, masters and a lifestyle that is focused around an inner path of prayer and mediation while fully engaged in the professional world of today raises questions for many. Ever wonder why bad things happen? “An Upraised Chalice” is a thought provoking, riveting story about one persons drive to seek and understanding of life and the world around him. A world-wide quest for the Ancient Wisdom is the back drop of the story that expands with the passing of the years and multiple near death encounters. The appearance of Archangel Michael in one instance, warning the author immediately prior to a fatal accident in which the author was killed and then sent back, poses important questions that are explored in this work. Near Death Experiences – are they real or as scientific naysayers state “the result of lack of oxygen to the brain” – What makes one of the near death experiences detailed in this story so different from others we’ve read about or seen in the news is this – Archangel Michael appeared and warned the author to prepare with a prayer/mantra of protection a minute before the fatal 80mph+ head-on impact. Both drivers were killed, but the author was sent back repeatedly The author detals a life long chain of events that prepared the way for this intercession and other that occur through the course of this story.